3. from Korsfjord to Gamneset. The primary results of these calculations are extreme values of wind speed, wind waves and swell at the location. The data model may, however, can also be used to calculate predicted down-time (in e. g. hrs/year) by specifying limit values of wind speed, wind wave height and swell height. Local wave heights are moderate as expected. Swell and ocean waves may be noticeable, but are generally negligible. 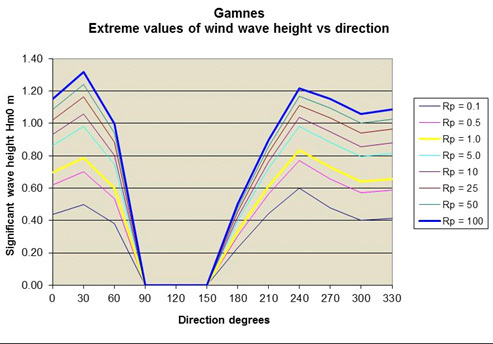 The design should, however, include the possibility of swell waves with periods 12 – 16 s. Local wind waves have periods up to 4 s, which means that wave lengths could reach approximately 25 m. For a large vessel (lengths > 100 – 150 m) these short waves will give very small motions and hawser forces. All wave heights are significant wave height values. The expected maximum single wave height is approximately 2.0 x the significant wave height.